We'd been on the prowl for a few years for a high quality Syrah grower in the Russian River Valley when we were fortuitously hooked up with the grower of this small vineyard. Although his fruit was under contract with another large producer, he agreed to "sneak" us a bit on the side. We were so pleased with the results that we asked him to plant two acres of Syrah strictly for Carlisle. It will be all clone 470 with a small amount of Viognier for optional co-fermentation. 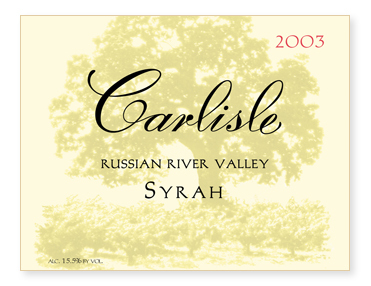 First significant fruit from this "Carlisle" block should be in 2007. We can't wait!!! But in the mean time, shhh! It's a secret!